April 24, 1966 -- The Chicago Tribune reports that as the old Federal building, bounded by Dearborn, Clark, Adams and Jackson, is demolished, the building across Jackson Boulevard, the Monadnock, is coming into clearer view. And the Monadnock, constructed between 1891 and 1893, is getting a major interior renovation. Fluorescent lights, carpets, and new office doors are being installed and the interior is being painted with white walls and dark gray ceilings. When it opened the building was the largest office building in the world and its design a pure statement of farewell to one building technique and a welcome to the next. As Professor Thomas Leslie of Iowa State University wrote, "Far from being the world's last and largest 'masonry skyscraper,' the Monadnock was a profoundly transitional structural achievement, making important advances in steel construction while still relying on the well-proven strength and reliability of masonry." 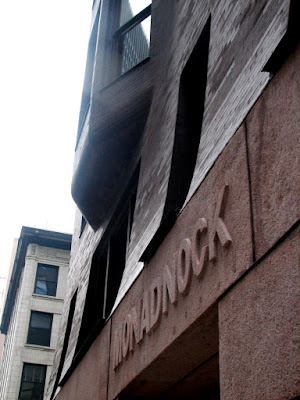 However you approach the Monadnock, it is one heck of a building.